Here I am again talking about the it-bag that was never supposed to be an it-bag which ended up making it an it-bag. Are ya following me? Because the duo behind Proenza Schouler exudes their genius by marketing a bag as an anti-it-bag that is anything but that. 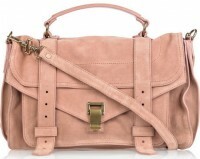 If I were to personally splurge on any suede bag, it would be the coveted PS1. You all hear me constantly talk about the problem with keeping suede clean, and I fully understand that this rose hue would be that much more difficult, but I love this color for spring. This rose colored suede is simply romantic. It will work perfectly with resort stripes or spring florals. I love the combination of a light and airy hue with suede. Something about this pair seems unlikely yet entirely fitting. We all know the Proenza Schouler PS1 is not going anywhere and this utility-chic version is yet another option to consider. Buy via Net-A-Porter for $1,595.